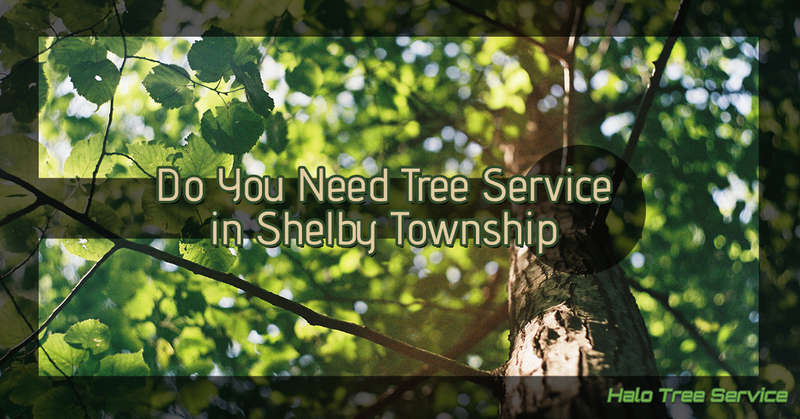 Halo Tree Service is passionate about maintaining the natural beauty of the Shelby Township as a whole, including Macomb and Rochester. We take pains to ensure that your trees continue to live, content and beautiful, to preserve the natural beauty of our neighborhoods. Most of the time, that means good quality tree trimming that will guide your tree to grow in an aesthetically pleasing and safe way so that inclement weather won’t be able to get the better of it. When you’re in need of amazing pruning services, where each cut, each clip, is a product of a carefully crafted blueprint for each of your trees, reach out to us. We’re here to help you with small, minimal pruning efforts in between our visits and how to guide you tree toward healthy growth. Together, we’ll create a landscape full of towering native and exotic foliage that frames the blue sky and our homes with a vista of leaves and twisting, healthy bark. Our pruning practices are complex and, while we can’t give away all of our secrets, we can inform you of the in-between care of our own services. As professional tree trimmers, we’re experts on making the perfect cut to a tree, so if it’s just a single branch that’s ruining your outdoor groove, poking people in the eye, or getting too close to your tiki torches for comfort, we have a few ways that you can handle that and identify if you need to call in the professionals to help with the entire tree’s design. The best cut is a clean cut. That doesn’t mean you need to sterilize your clippers with isopropyl alcohol or hold them over a flame for some time. It means making a cut that your tree can heal around. Every cut a plant experiences is much like a wound. It’s an open sore that could potentially allow bugs and other issues to enter the tree through. This is true for even small, pruning cuts, so the cleaner the cut, the faster the tree can heal it and protect itself. Good cuts can actually expedite the tree’s growth in various areas and allow the tree to develop a fast healing process. It’s much like getting a cat used to taking a bath: the more frequently you do it in a skilled and gentle fashion, the better the animal, or tree, in this case, will adapt to it. The first step for this is to make sure your tools are essentially absurdly sharp. The idea of pruning and trimming is to guide the tree in where and how it should grow. To be able to understand how the tree is growing, you’ll need access to equipment that allows you to look down on the tree to see where it’s growing tendencies are and estimate how to expertly manipulate that to ensure the tree is both healthy and good looking. This is outside the abilities of most homeowners, thus that’s where Halo Tree Service comes in. If it’s a mere pruning issue, it’s not a big deal to make a few cuts here and there on your own, but if you’re invested in the tree’s longevity, it’s best to hire a professional tree trimming service right out of the door. If you were to attempt a full tree trimming you’d have to follow a few specific rules that will keep you from permanently damaging the tree and hindering the continued growth and development. When trimming a tree, you can never cut away more than 1/4th of the tree’s crown in a single season. Additionally, the main side branches should be around ⅓ small than the diameter of the trunk itself. If your tree is considered “deciduous” or a broadleaf tree, you should not be pruning up from the bottom by any more than 1/3rd of the tree’s complete height. That means if you can't see the crown and you can’t make exact measurements of the tree’s height, you should avoid trimming these branches altogether until a tree trimming service can attend to the issue. In general, your side branches that form angles that are around 1/3rd off from being vertical should form perfect 90-degree angles at 10 o’clock and 2 o’clock on either side of the tree. Some irregularities can be accepted, but otherwise, you might have cause for concern in regard to the strength of the wood and how well it’ll fare if there are high winds and other bad weather conditions to concern yourself with. If at any point in you home-pruning process you think you’re about to break one of the main tree trimming rules, it’s best to call in the professionals. While there are a variety of reliable sources out there that can advise you on how you can make minor trims and adjustments to your trees, there are plenty of pruning practices that you should just avoid. Unlike the other tasks you should leave to a professional tree trimming service that we previously mentioned, these methods should just be avoided altogether. Some places would have you believe that certain types of trees and greenery actually have special needs as far as what time of year they can be pruned. According to some, trees that bloom in the summer until later in the season. You’ll probably also hear that trees or shrubs that bloom later in the spring should only be pruned after they have finished blooming. Sometimes these actually can’t be followed and are rarely rules so much as they are merely suggestions. Sometimes, neglect, damage and just construction of the tree itself gets in the way of following some arbitrary schedule. Trees and shrubs are famously pretty hearty. As long as you’re keeping them in good health, they’re built to last. So if you need to get your tree trimmed outside of whatever perfect day you’ve heard, fret not, it can be done. This isn’t an early worm catches the bird example. Just because you wash your toilet at the beginning of the week, doesn’t mean you won’t have to wash it next week and it’s the same way with trees. Repeated maintenance is a regular chore, not because it can all be done in one shot at the beginning of the season. You can’t just cut your hair super short and think it will maintain itself, it’ll grow and change and so will your tree. The maintenance for your tree will need to be done in small, regular intervals through the year. While it’s true that getting the major pieces out of the way early in the spring will ensure the tree grows in a more favorable fashion throughout the year, but past that it’s rather unpredictable. Think of pruning as doing surgery on your tree. But not like, removing a mole surgery, more like removing an arm. If your tools aren't sharp and well-equipped for the job, you’re doing a disservice for your tree. One of the main problems with amateur, at-home pruning is that the cuts aren’t ever really clean enough and slapping a band-aid over it won’t necessarily stop the disease from entering the wood and spreading throughout the organism. It won’t heal properly around the tree sealer and it’ll leave openings in the wound as it heals incompletely and slowly. With an uptick in harmful exotic species of tree that carry disease around, it’s more worrisome now than ever before to keep your trees healthy and to be extra careful that your tools are clean and sharp if you attempt to make an on-your-own cut. The Shelby Township is rich in history, both personal and related to the very development of Michigan itself. With such lush forests and surrounded by various parks and a variety of other beautiful natural elements, we’re a town made of people who appreciate nature. We find peace in living in harmony with other life and we’re passionate about ensuring that lasts. The next generation should be able to enjoy our richly green landscape as much as we have, so we’re dedicated to ensuring your trees stick around to see that day. Each cut and each clip is calculated and balanced. We’re here to enhance and enliven your trees and shrubbery so they both look and feel their best. Their continued longevity is our chief concern, but if it’s time to cut our losses, we’ll be the first to tell you and provide you with a variety of tree and stump removal options. We’ll guide you in how to choose a new tree species that will be more resistant to the pests currently in the environment and anything else we can do to help. Together, we can continue to shape and craft a landscape for the whole of our town that we can all be proud of. Reach out to us to find out more or to schedule your consultation.